Minefields are, quite rightly, well feared by troops and commanders alike. Hidden, silent killers, these weapons can lie dormant for years and cripple men and machines alike. With the Cold War stand-off between NATO and the Warsaw Pact in full flow, both sides planned to make extensive use of minefields to disrupt enemy movements and attacks. The side with the fastest and most efficient means of clearing a path through an enemy’s minefield would obviously have a significant advantage in a war. 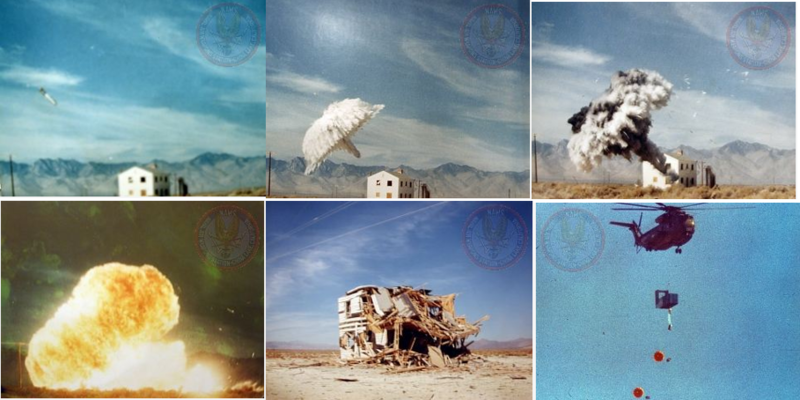 Early research work with turning Fuel Air Explosive (FAE) technology into weapons was undertaken by the US Navy in the early 1960s at their China Lake Naval Weapons Center in California. 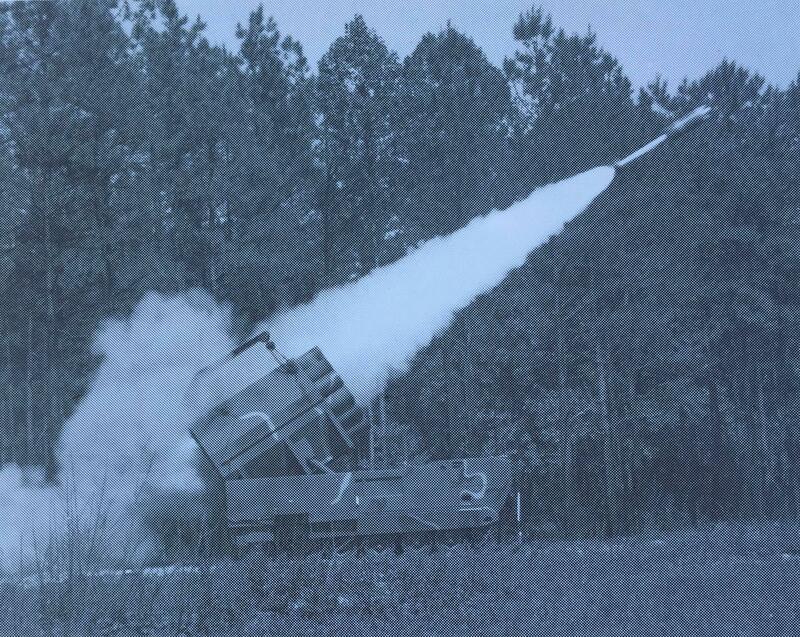 By the mid-1970s, research had progressed sufficiently to weaponize FAE technology into two primary weapons systems: one ground-launched which was developed in conjunction with the US Army Missile Command (MICOM), the ‘Surface Launched Unit’ (SLU-FAE); and one delivered by air, the CBU-55/72. 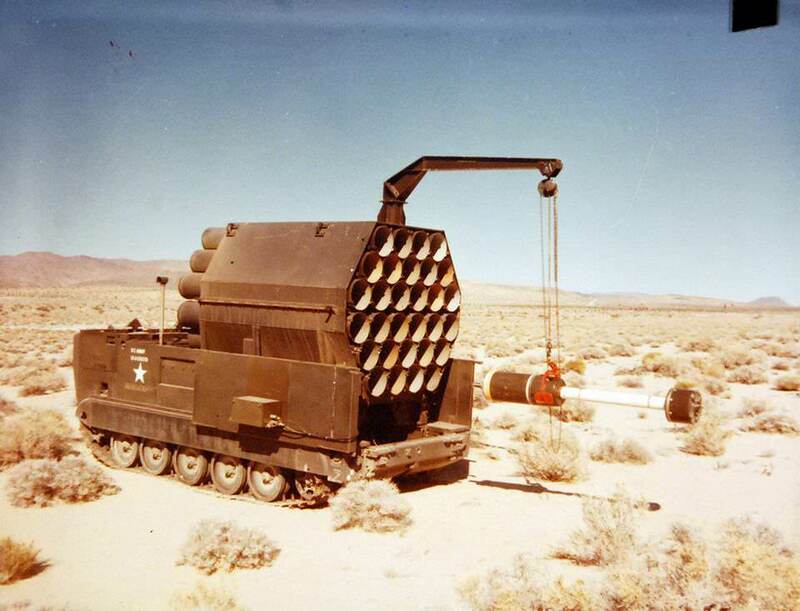 The design was completed by 1975, and prototype firings ready that year for testing the SLUFAE for its intended primary role, defeating enemy minefields. This evaluation was done in conjunction with the US Army Mobility Equipment Research and Development Center (MRDC) at Fort Belvoir, Virginia. The SLUFAE system consisted of a single giant octagonal ‘pod’ containing 30 smooth walled 35cm diameter tubes, although the original artwork for the program had shown 36 tubes in a rectangular pod and then confusingly described it as a ‘30-tube’ system. These barrels were able to the fired individually or ripple fired at intervals variable from 1.0 seconds to 9.7 seconds in 1/10 second intervals. The whole system could throw all 30 rockets in sequence which was capable of breaching an 8m wide path 900m long. The minimum safe detonation distance was 100m so the carrier could park as close as 100m from the edge of the minefield and launch the rockets. 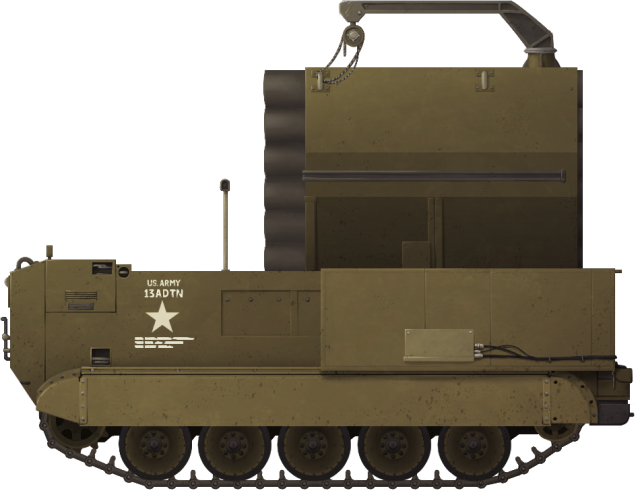 The whole pod was to be mounted on a ground vehicle and the vehicle selected was the M548 Tracked Cargo Carrier vehicle, although it has also been described as being based on the M752 Lance Missile Carrier which was being decommissioned as a platform at the time. Stowed horizontally on the back of the M548, the POD stuck up well above the vehicle line and could be elevated up to a maximum of 30 degrees when the POD was to be deployed. 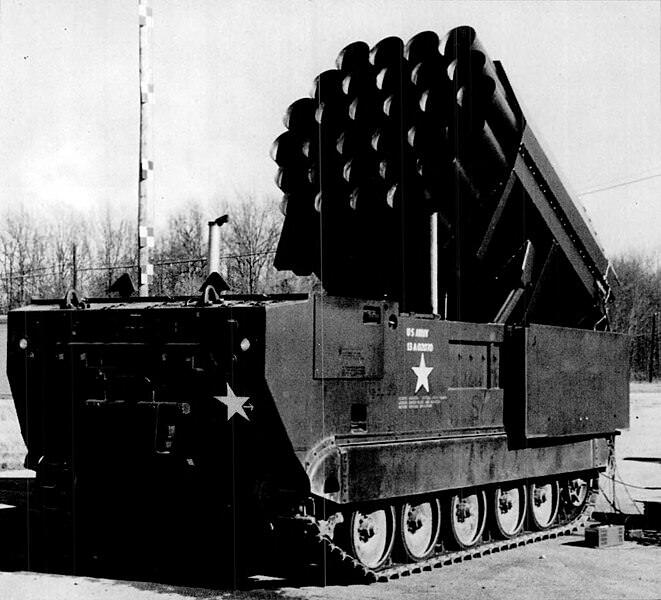 The XM130 SLUFAE (also sometimes written as ‘SLU-FAE’, was a 2.55 m long, 345 mm diameter, 84.8 kg unguided rocket fitted with an XM750 Slowed Nose Probe (discriminating against the effects of foliage) and Mild Detonating Fuze. Propelled by a 5” (127 mm) ‘Zuni’ rocket motor inside the launching tube body, this would propel it from the vehicle-mounted tube out to a maximum range of 1000 m, although 700m was deemed to be the effective limit. Once over the target, the rocket was retarded by a parachute in the tail shroud and the main charge, consisting of 45 kg of Propylene Oxide (PO) explosive liquid, was burst over the target forming a cloud 12’ x 54’ (3.7 m x 16.5 m) which was then ignited (150/1000 second delay) causing a huge explosion and overpressure on the target which would subsequently detonate any mines. 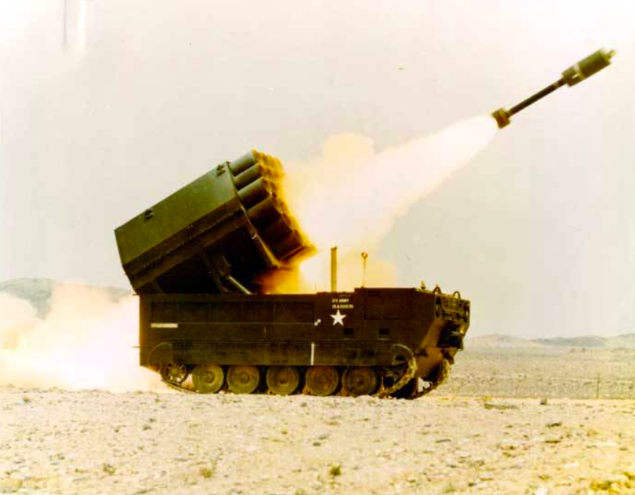 An inert version for training use was designated XM131. Accuracy for this unguided system was poor though. with a dispersal of 2.6 m laterally and 6 m in range for every 300 m traveled, meaning a maximum deflection of 8.6 m laterally and 20 m in range leaving a chance that at the end of the lane of cleared mines that some mines may not have been covered by the overpressure. The Cargo Carrier M548 fitted with the large Surface-Launched Unit, Fuel Air Explosive (SLUFAE) launcher fitted to the rear of the vehicle. Illustration by Andrei ‘Octo10’ Kirushkin, funded by our Patreon Campaign. Testing of the SLUFAE on the M548 took place in 1975, with further tests throughout 1976 and 1977. Consideration was given to the effectiveness of ground-pressure detonation of mines, including tests of the FAE system (although not SLUFAE rockets) on frozen ground in Alaska, which provided concern over their effectiveness, particularly against frozen or partially frozen soils. By 1981, further studies were recommended into the performance degradation of this type of system in cold temperatures and against the frozen or thawing ground. The overpressure effects on vehicles and troops were devastating. 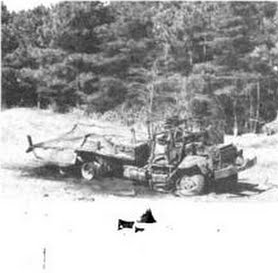 Trucks were crushed by the overpressure and exposed troops would be killed or seriously injured. Light structures such as houses were seriously damaged, but the effect was very small against armored targets. The primary intended use had been seen in using overpressure against landmines causing them to detonate and under normal temperate conditions, it had worked. The use of FAE had even worked for underwater mines, making it suitable for use in clearing mines laid below the water line on a beach, but the carrier was unprotected and the whole system was huge. The SLUFAE system was eventually not adopted for use. In the 1998 patent for an improved version of FAE mine clearance, a description of the SLUFAE rockets put the maximum range to just 700 m and that to ensure mines are destroyed a lot of overlap was required to destroy single impulse mines or ones buried in excess of 15cm deep. As a result, the clearance area from 30 rockets was just 8 m by 160 m, substantially less than the 700-1000 m lane originally intended. This is likely the key reason the system was not adopted. It just was not reliable enough. 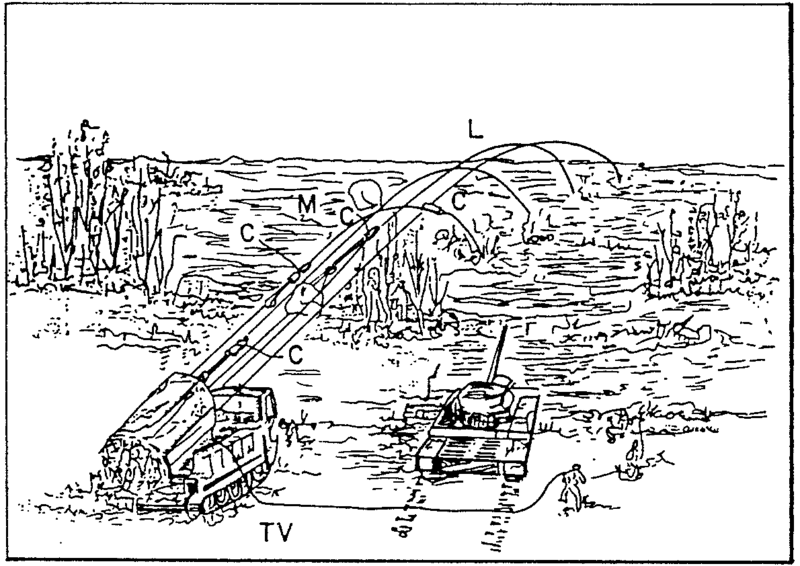 Systems such as ‘Giant Viper’ were more effective and provided a cleared lane through a minefield by virtue of the 183 m long hose filled with PE6/A1 High Explosive. That system was much simpler logistically as it was carried in a trailer and could be brought to a designated area by almost any vehicle rather than relying upon a dedicated and much bigger tracked carrier. The SLUFAE was a good idea but was unsuitable for actual combat. The USMC, who was particularly interested in amphibious assault vehicles, looked at the Army’s SLUFAE for their own use in 1987. They concluded that “this system is not compatible with Marine Corps amphibious assault and tactical vehicles, does not provide a breaching capability starting at the high watermark, and does not meet the Marine Corps stated requirements”. The development of SLUFAE had been quick in military terms, completing development and being officially accepted in December 1980 (FY 1981). It had been pursued, however without sufficient testing under different terrain conditions and the tactical disadvantages of this large, vulnerable and conspicuous machine were readily obvious. It was duly shelved and received no procurement orders. By the 1990’s, FAE technology had continued with the addition of aluminum particles to increase the overpressure from the blast, but the SLUFAE rockets were gone. Nothing is known about the location of the SLUFAE launcher, but at least two rockets survive. One in a private collection and one in the collection of the Hawthorne Ordnance Museum in Nevada. The original design had morphed to consider the use of a flexible hose containing FAE launched in a manner similar to that of the ‘Giant Viper’ system. Instead of exploding in the air, this version of the SLUFAE system would explode on the ground instead. The means of destruction was the same though – the creation of a pressure wave to detonate the mines. The system was never adopted though and production of the SLUFAE was limited to a single prototype. Jai Agrawek, High Energy Materials: Propellants, Explosives and Pyrotechnics.